The selection filter, which is a simple pulldown menu on the toolbar, allows users to quickly filter selection by members, materials, etc. More and more emphasis is being put on an accurate model, and SDS/2 has developed several tools with this in mind. Checking and approval in the model is something that is more commonly done now than ever. 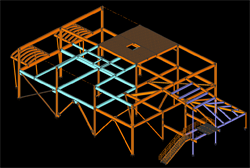 Generating CNC files, reports, 3D models for BIM, and more can all be done based on the items selected in a model. This brings up the topic of whether or not all the tools are being utilized to work as efficiently as possible and provide the best product to the customer. In previous versions of SDS/2, commands were always done using a list of all the members or submaterial in the model. 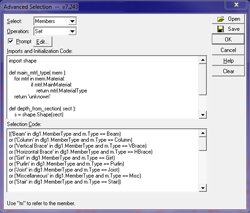 Users would be required to select the members or submaterial from a list before the command could be performed. Of course there were simple filters to narrow the list down to certain sequences, member type, material type, etc., but this has proven to be insufficient in different ways. Commands that can now be run based on the selection in the model include: CNC download, ModelLINK, Detail Selected Members, Autoload Details for Selected Members, and reports that have been modified to select Member Numbers. While this is all helpful, the real challenge is selecting the correct items in the model, and this is where the selection tools come into play. Most of the selection tools discussed in this post will work with pre-selection, meaning you must select the items you wish to perform the command on, before you actually invoke the command. If the command is invoked before selecting any members or materials, it may filter everything except the items that it is possible to be performed on; this is also known as post-selection. The first and simplest selection tool to use is the Selection Filter, which is a simple pulldown menu on the toolbar. SDS/2 will only allow users to select the item type chosen in the Selection Filter. As an example, if Beams is selected in the Selection Filter, users will only be able to select beams in the model. If the Custom option is selected, it is possible to select multiple items to filter. The option By Expression will be addressed later in this post. The Status Display feature allows members to be masked or displayed in different colors for easy selection. While Status Display can be used just for a visual display in the model, it's also very useful when used in combination with selection. Status Display consists of configurations that can be saved from any project and loaded into others. Each configuration can be set up to display members in different colors or even mask them based on parameters set by the user. Parameters that can be set include: sequence, member type, members with failed connections, approval status, custom properties, specific piecemarks, and much more. Users can then work normally in the model with Status Display showing members in different colors or masking them, which gives a very quick, visual way to easily select members. When members are masked, users are prevented from selecting them. To learn more about how Status Display works visit the Global Review Training – Statusing section of our YouTube channel. In the Advanced Selection dialog, users can create their own selection code or modify the code for existing selection files. Click on the image to enlarge. Advanced Selection requires users to create their own selection using Python code. While this does require knowledge of the Python language and some basic programming skills, the possibilities of what can be selected are almost limitless. 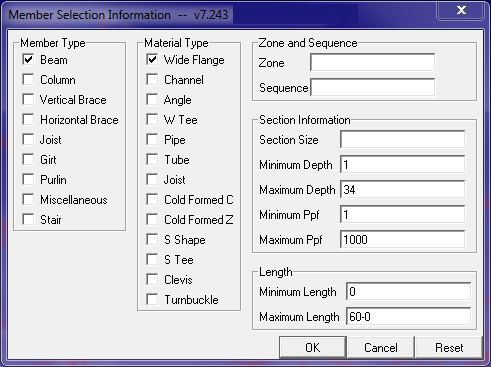 Users can select members, materials, holes, or bolts based on almost every parameter available in SDS/2. Items can be selected by ranges of lengths, only members that have a certain length, or maybe only members less than a certain length. This could then be narrowed down even further to only select those members that have a certain grade, depth, connection type, user input load, or a combination of all these parameters. Dialog boxes can be created so when the advanced selection is run, different options can be chosen to select certain items. Keep in mind this also works on materials if you want to select plates with a certain thickness, holes of a certain size, or all A325N bolts that are 2” long. The Advanced Selection code that is written can be saved and opened to be used on any SDS/2 model. If you wish to learn more about Advanced Selection, this is part of the Continuing Ed courses that Design Data offers. There are several Advanced Selection files that are installed with SDS/2. There are about 30 selection files available to users out of the box. To run these, go to the Edit pulldown and select Advanced Selection Run…, then choose which selection file to run. Once the selection file is chosen, the dialog for the chosen selection filter will provide further options by which the user can control what items will be selected. Users can modify the selection code by clicking Open on the Advanced Selection dialog window and selecting the selection file to be modified. 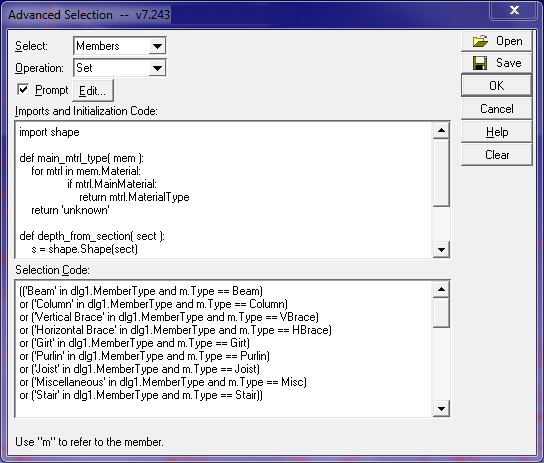 In this example of an Advanced Selection, users can choose which member and material type to be selected. Narrow this down even further by limiting the zone, sequence, depth, length, etc. When an advanced selection is run, all items that meet the criteria will be selected. For added control over member and material selection, Advanced Selection can be combined with the Selection Filter if the option By Expression is selected. This then allows users to box an area to select the members that meet the Advanced Selection criteria rather than all items that meet the criteria in the model. After one of the above selection tools has been used to select the items, users will then invoke the command desired to be performed on the selected items. Whether this be a report, CNC download, or ModelLINK export the information provided will only be of the selected items. All of these tools can also be combined and used together to become even more powerful. Status Display can be set and then the Selection Filter used. Narrow this down even further by using the By Expression option for the Selection Filter, which incorporates Advanced Selection. Don’t forget about the Model Tree, which is a list of all items in the model that can be sorted by member piecemark, member number, or material piecemark. When sorting by the member piecemark or number, all materials, bolts, holes, and welds will be listed under the corresponding member it is associated with. This also includes a Find option that will search for specific piecemarks and can be used in conjunction with the Selection Filter and Advanced Selection.